This is my craziest thing yet, filled with browser-crashing technologies which turn any WebGL-capable machine into a client for worlds created with Blender, uploaded to Google Drive, and collaboratively edited. Nimloth Station: Based on the latest maps of our galaxy. Dawn's Lookout: The best view of Vesta there is, courtesy of the Dawn spacecraft. As well as bringing 3D Blender scenery to the web, Astromech contains some powerful scientific-grade tools, such as digital signal processing chain capable of real-time 2D FFT and convolution on video data (from the Webcam interface), orbital elements, delaunay triangulations, general matrix operations, and a peer-to-peer messaging system. The 3D library was written from scratch for performance, and contains 'primitives' such as geometricaly perfect spheres and cartographic projections for rendering planets with common data formats. Alas, much of the functionalty is still "hidden" in the source code and rare examples. This map combines near real-time information (hourly to daily updates) from multiple public agencies to give a composite view of fire incidents affecting Australia. NTFRS is finally online, so all states and territories have a feed. 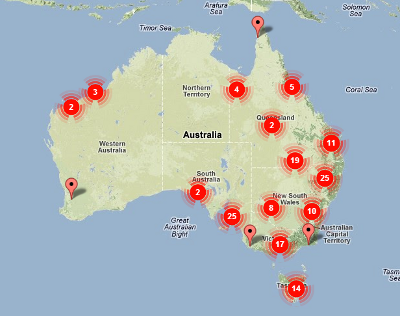 I started this live map back in 2011 when the closest equivalent (The Google Crisis Map) only covered New South Wales. It was done as a labor of love, because no 'integrated federal map' existed at that time, and I thought one really should. In the years I've been going I've had a lot of positive feedback (especially from people in the ACT, who previously had to deal with up to four seperate maps) and even been republished by major news organisations. I have decided to keep the map running for the forseeable future (it was close for a while) until there is a comparable service available elsewhere. The fire map is intended to be an informative overview, and should not be used for 'critical' decisions. For emergency information and local updates, you should always be listening to the ABC and your state's fire agency.